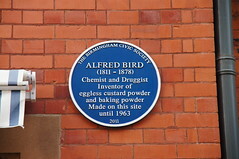 Alfred Bird (1811 – 15 December 1878) was an English food manufacturer and chemist. He was born in Nympsfield, Gloucestershire, England in 1811 and was the inventor of a series of food products. His father was a lecturer in astronomy at Eton College. His son Alfred Frederick Bird continued to develop the business after his father's death.